Continuing the top 5 summer fly list we come to #2 on the list but probably (actually definitely #1 in my heart) my first and favorite dry fly to fish on a summer outing, perhaps all year long for that matter. This fly has a mixed and debated history behind it’s inception and evolution. It is a fly that’s range is as wide as the territory it is useful in for reasons of versatility in both the spectrum of size and color variation. This fly can be dead drifted, skated, swung, and used as a stealth indicator according to your needs at the time. It is a must have summer fly and actually should be along with you year round. Without further adoring pontification I give you: The Stimulator. Very light internet research into the background of the Stimulator reveals that there is great debate over the owner of it’s inception. While several websites ( Including a 2011 Field and Stream article ) credit Randall Kaufmann as the iconic fly’s creator, there are still many others that give credit to New Jersey’s own Jim Slattery. Slattery claims to have created the legendary fly after watching fish feeding voraciously on stoneflies while fishing the Mosconetcong River in New Jersey. 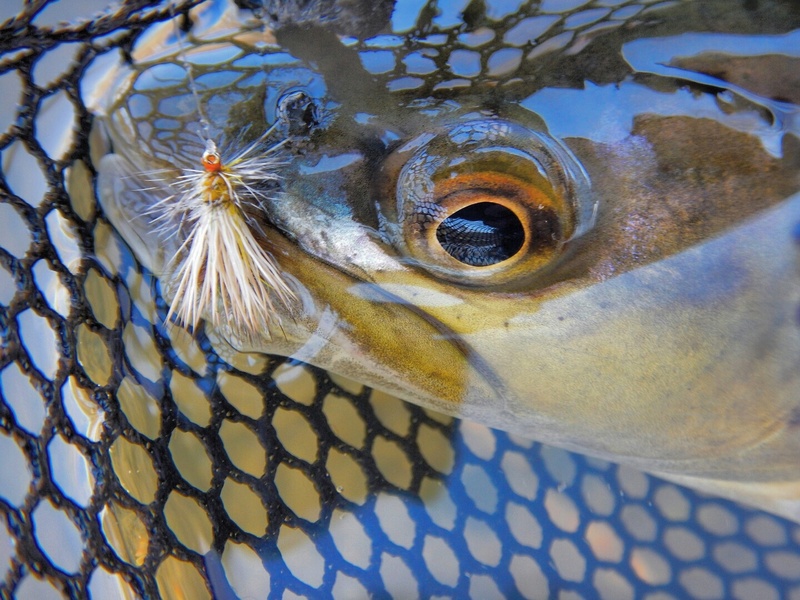 More articles about the versatility of the fly and how to tie and fish the stimulator have been made all over the internet including a great post by Phil Monahan on the Orvis News website. All that to say the fly has been around for a LONG time and show’s no signs of going anywhere but in the mouth of your next dry fly sipping trout! So now that we’re done with the history lesson what does this have to do with the average keystone angler? A LOT! Starting as early as April I make sure to have “Stimmies” (as I affectionately call them) on me at all times. This fly not only can represent a stonefly but due to it’s extremely buoyant design it makes one hell of a Grannom Caddis. This profile and tie makes this pattern my number 1 “go-to” fly to skate over riffles when early caddis are mating and dropping eggs. I have caught fish even when this fly has briefly submerged and re-emerged while skating or swinging. I have used variations of the stimulator including yellow, yellow body/orange head, and my favorite grannom skater: Royal Stimulator #14 or 12. Since we focus on mostly Pa fishing here I don’t really use too many stimmies larger than #12 it is worth mentioning this pattern is often tied as large as a #8! As for the summer? This is when the stimmy really shines. The Stimulator is classified as an attractor pattern and this is appropriate as it garners plenty of attention on all types of water including slow pools and fast riffles. As stated earlier the pattern was originally designed to mimic stoneflies which is great for summer fishing in the Keystone state because summer is the season of the yellow sally. Those small yellow stoneflies that can be found emerging and landing on many of our waters throughout summer afternoons. Because of this availability trout seem to be willing to inspect if not inhale our deer haired imposters with little hesitation. However, when summer conditions present low and clear waters as they often do, the “stimmie” offers us yet another great opportunity to produce results. Tying a nymph or other wet-fly of the bend of a stimmie in a tandem or “dry/dropper” rig can give the summer angler the edge. Conditions don’t have to be low and clear for this tactic to be advantageous, it is a tried and true approach that can reliably produce results. A Stimulator is a must have fly for the summer fly angler in PA and it’s potential lasts well into the fall as it is one of my preferred patterns for large October Caddis as well. Much like their spring counterparts these flies can be observed skittering over riffles in the fall depositing their eggs in riffles. The Stimulator shines as one of the few patterns that is useful most of the year. Aside from it’s “buggy” look and practical materials, the Stimulator possess a classic composition that fits right at home with the most elite dry fly snob as well as the most astute tactical fly angler. This is a must have fly for the summer and beyond. So there’s #2. Did I do it justice? miss anything? am I completely wrong? Let’s hear it! chime in and let me know! I like to use a little powder floatant and let it bob and skate through the fast water!